Bob loves to DJ. Wasn't it Bob that said "It's not work if you love what your doing." Bob is a business professional during the day and a DJ at night. Bob loves the great state of Wisconsin and it's sports teams the Packers, Bucks, Brewers, Badgers and Warriors. Bob loves Milwaukee so much he once had the Bucks basketball team over to his house for a picnic. Bob is a Pro – Pro with a long list of experience. Bob will keep your guest entertained, keep your dance floor moving, be great on the microphone and probably make a few new friends at your event. Bob is always looking for ways to get better at whatever he does. Bob also loves to help and is a great listener. 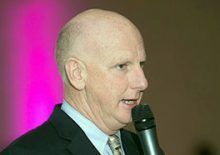 Bob will work hard from start to finish at your next event and rest assured, Bob will put all of his heart into it. I am passionate about helping people become successful. I work in the college ministry at Spring Creek Church in Pewaukee. I like to help young people discover their skills and gifts and then set goals and directions for their lives. I also believe in serving the community and I am a board member of the Community Warehouse, a faith based building supplies non profit located in Milwaukee. I am also a board member of the Fellowship of Christian Athletes. We are a faith based organization that promotes the gospel in high schools to student athletes and coaches. I believe that using my experiences in life makes me uniquely qualified to help couples on their wedding day. I really love seeing the impact I've had on people's lives though the power of music and entertainment. I am the new Senior Director of Business Development at PS-Companies, located in Milwaukee. We are a full service staffing and recruiting organization, specializing in legal recruiting, executive recruiting and professional temporary help. We are proud to deliver to our clients our individualized attention, highly qualified candidates and competitive rates. Our reputation in southeast Wisconsin is unmatched. Our commitment is to integrity, honesty and to providing our clients and candidates with exceptional matches. PS Companies has the best staff in the industry which enables us to offer a guarantee that is unparalleled.